Hello everyone. It’s the first of June and time for the Minis and More Parade by Sherri and Michele. This is also 2016 Finish-A-Long number 4. You can find my list of 2nd quarter finishes here. May’s pattern was Mini Popsicles by Fig Tree and Co. Instead of a table runner, I decided to make mine into a pillow. 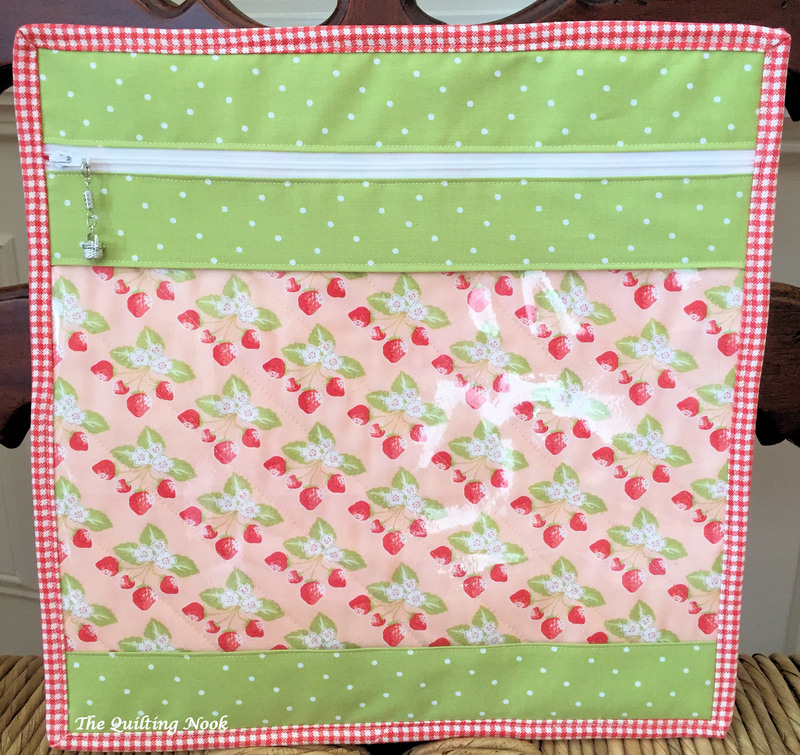 I used leftover charm squares from Scrumptious, Miss Kate, Day Sail, and the pink dot is from Vintage Picnic, all by Bonnie and Camille for Moda. The sticks are scraps of Kona Ivory. The check border and dot binding is Vintage Picnic. The blue background is the Moda Solid that went with Miss Kate. It’s on the bench in my foyer with another Mini from last year, Vintage Tulips Mini by Thimble Blossoms. It looks like I need to make one more to even out the bench. I wanted to show a little of the quilting. It’s hard to see it on the blue in these pictures. I did an open swirl in the background and added flowers and butterflies, perfect for popsicles outside on a summer day. This is the first time I used this design. Last time I tried, I wasn’t very good at it. I practiced on paper first. I have a hard time making my swirls consistently round, but I took my time I was pleased how it turned out. You can see the flower and butterfly in this picture. It was fun to quilt. I used Aurifil 50 2780 in the background and 2000 on the popsicles. In the border, I used Aurifil 50 2110, a pale yellow. I also quilted the border and popsicles using my Westalee Ruler Foot and the Westalee Stright/Curved Template. I wanted to quilt along the check lines, but there was not a mark on the ruler that matched, so I used a piece of painters tape to mark my line. For the popsicles, I stitched 1/4 inch from the seam. To get the proper spacing, I make a 1/4 mark at each corner with a purple air erasable pen. This is finish number 4 for the 2nd quarter Finish-A-Long. I still have a few things on my list to finish. We’ll have to see how much I get done in June. I love making these minis. Don’t forget to check out what others are doing at Sherri’s and Michele’s blogs. Thanks for stopping by. This entry was posted in 2016 Finish Along, FMQ, Free Motion Ruler Work, Minis and More and tagged 2016 Finish Along, FMQ, free motion quilting, minis, Ruler Work on Domestic Machine. Bookmark the permalink. What a great way to welcome summer with the popsicle pillow-super cute! Love the popsicle pillow! Great color choices. I love your popsicle pillow…and the mini tulips pillow as well! Your popsicle pillow is adorable! Love it in your fabric selection! Looks really good! Nice work. Love that pillow and love to read about your process for quilting! I tend to fall short on the quilting so I love to read about the quilting process!!! Congratulations on the finish and thank you for participating in the 2016FAL, on behalf of all the hosts!